times, the legendary Dame Angela Lansbury, at the Four Seasons Hotel, Boston. A specially prepared film retrospective of her seven-decade career was shown, including scenes with costars ranging from Katharine Hepburn and Judy Garland to David Niven and Peter Ustinov, as well as scenes or music from Gaslight, The Manchurian Candidate, Mame, Gypsy, Sweeney Todd, and her popular television series, Murder, She Wrote. President and CEO Brenton Simons, the evening’s host, presented Miss Lansbury with a Lifetime Achievement Award in the Performing Arts, provided an overview of a family history prepared for her by NEHGS genealogists, and gave her a custom-made pen-and-ink family tree showing six generations of her family. These tributes were followed by a lively conversation about her career and family. Finally, Vice President and COO Ryan J. Woods presented her with an honorary membership in NEHGS. 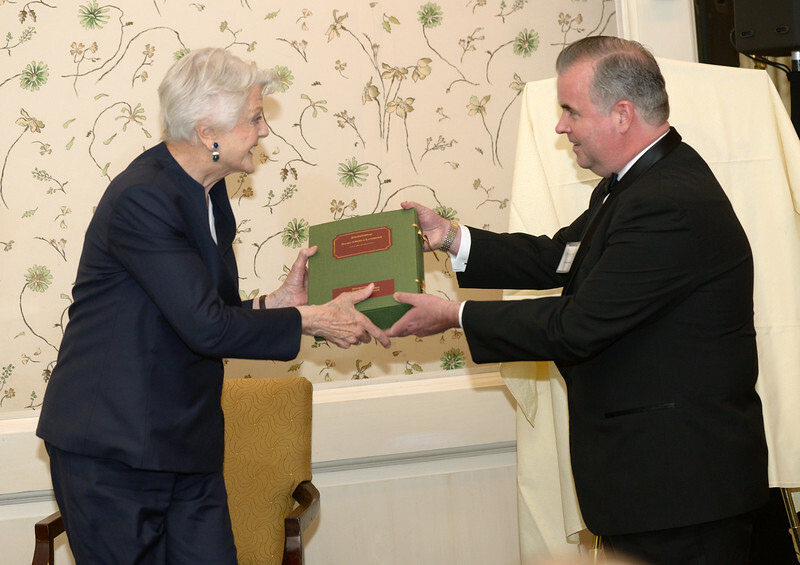 Dame Angela Lansbury receives her genealogy from NEHGS Editor-in-Chief Scott C. Steward.